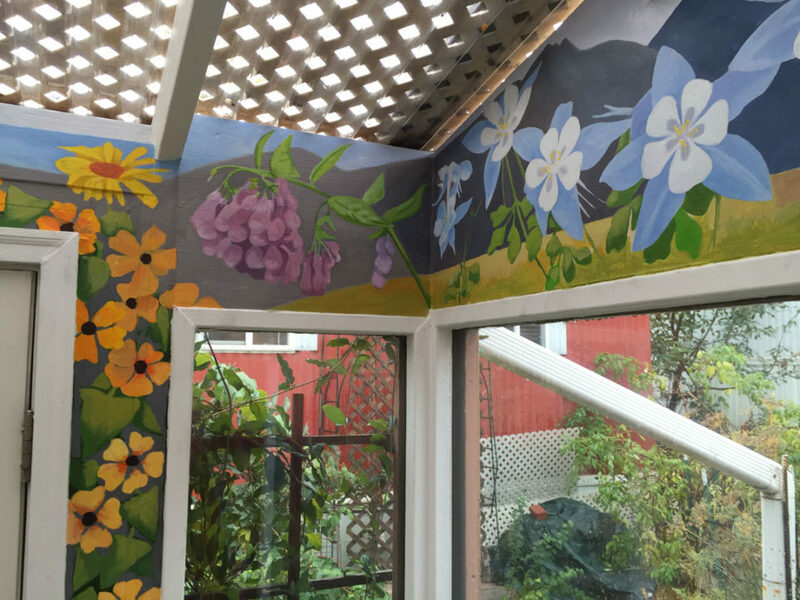 Mural in the home of Gene Langlois, 2015-2016. 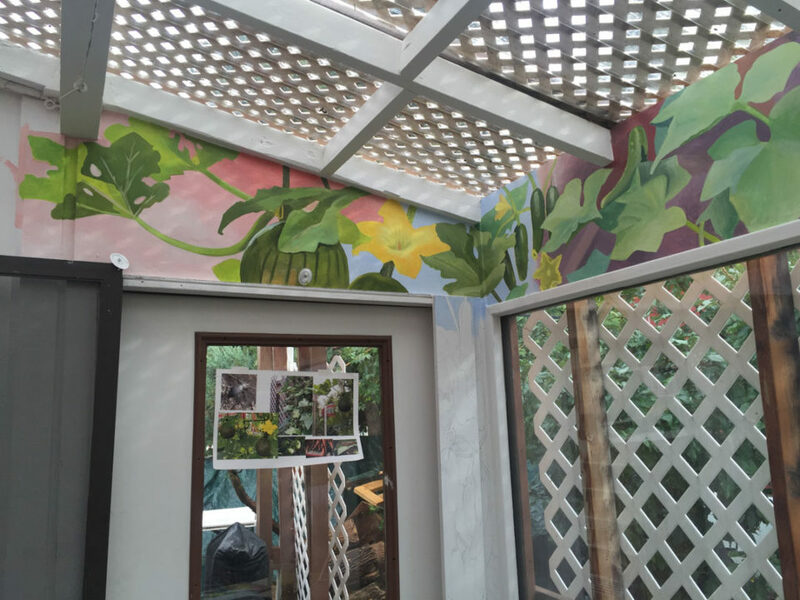 Gene commissioned this mural from me in 2015. 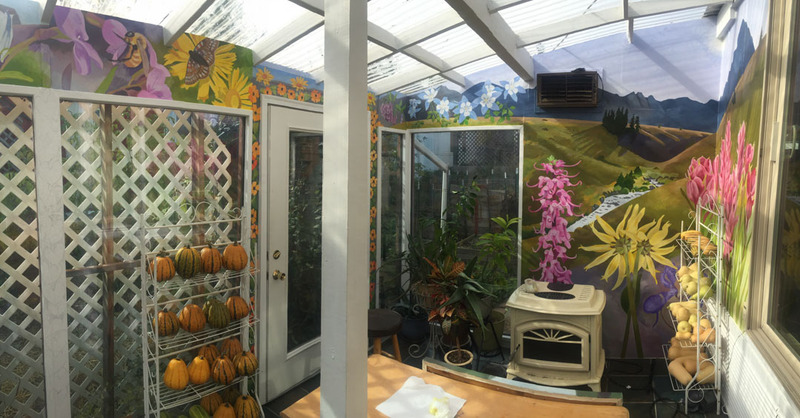 He gave me a lot of latitude in design, so I made it to reflect his abiding love of garden plants, as well as plants that grow in the mountains. 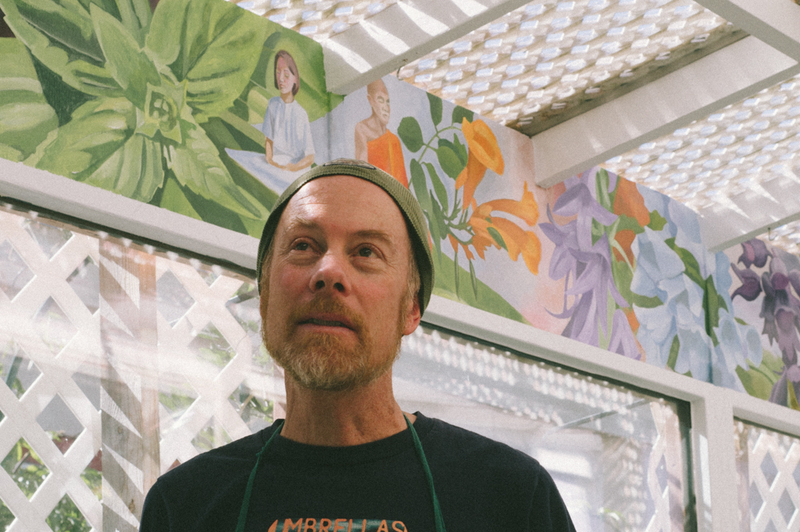 I came up with the idea because for years, I lived near Gene in the Mapleton Mobile Home Park in the center of Boulder, and every year Gene would have an incredible garden, producing beautiful and nutritious vegetables on a tiny patch of land. 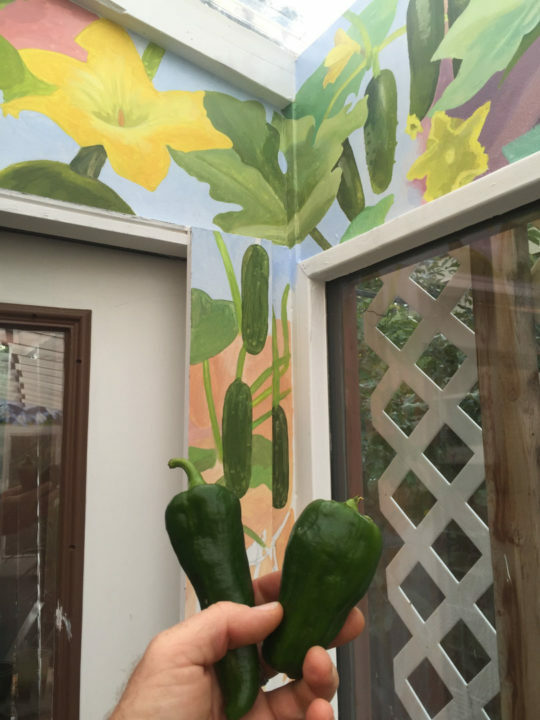 I wanted the mural to reflect his love and success in gardening, but to also make a link between Vegetables and angiosperms, since I love all plants. 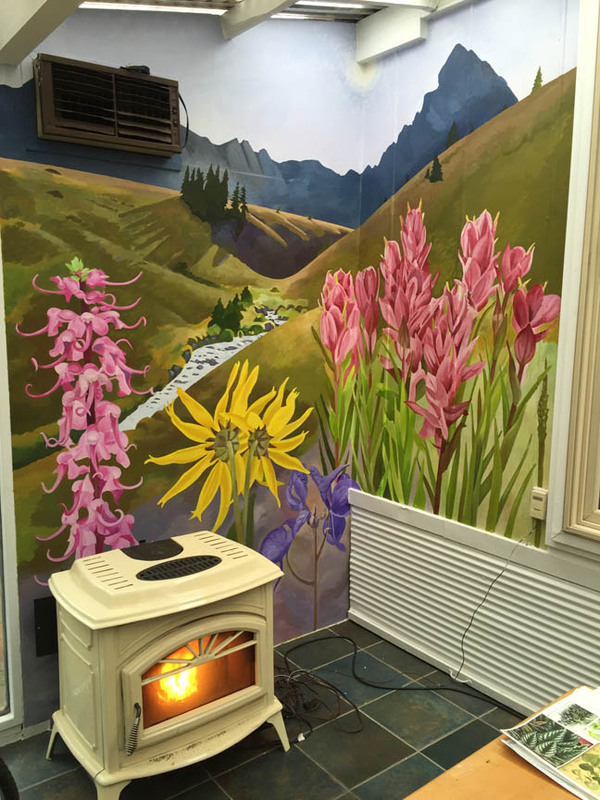 The mountain/flower scene on the west wall, with the pellet stove, was painted from photos I had taken from visits to Colorado’s Wetterhorn Peak. 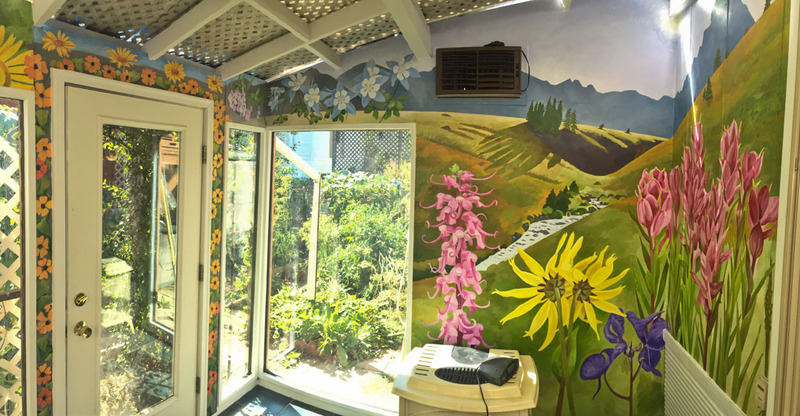 Those flowers, starting under Wetterhorn Peak, are Indian Paintbrush, Monkshood, Arnica, Elephant Head and Columbine. 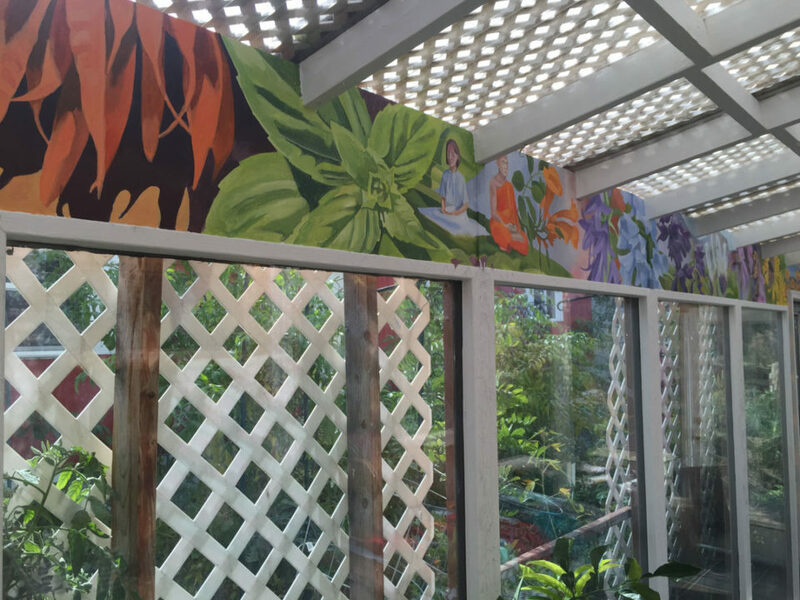 On the long, narrow south wall, starting on the west end, the progression continues with Mountain Chiming Bells, Black-Eyed Susans, Alpine Sunflowers, Fireweed (with a Bee), Gentian, Whipple’s Penstemon, Sky Pilot, Harebells, and Trumpet Vine, ending at the male meditator. 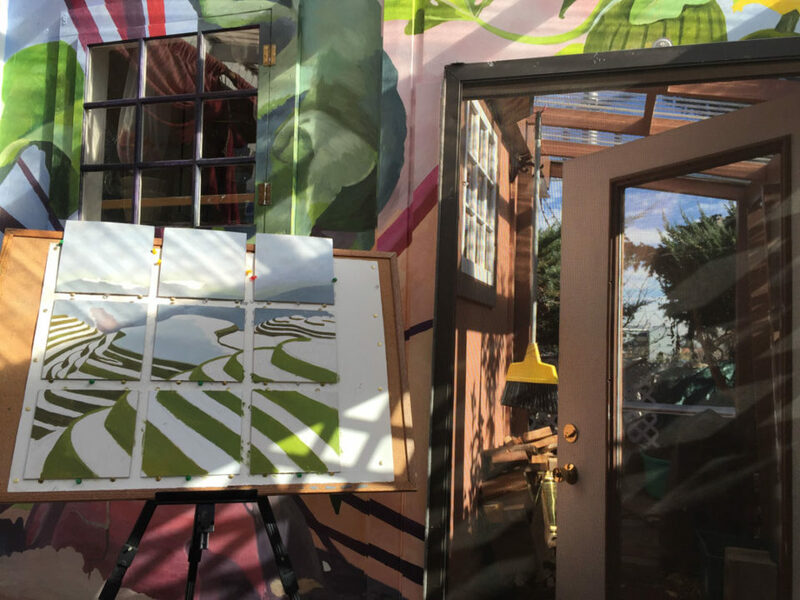 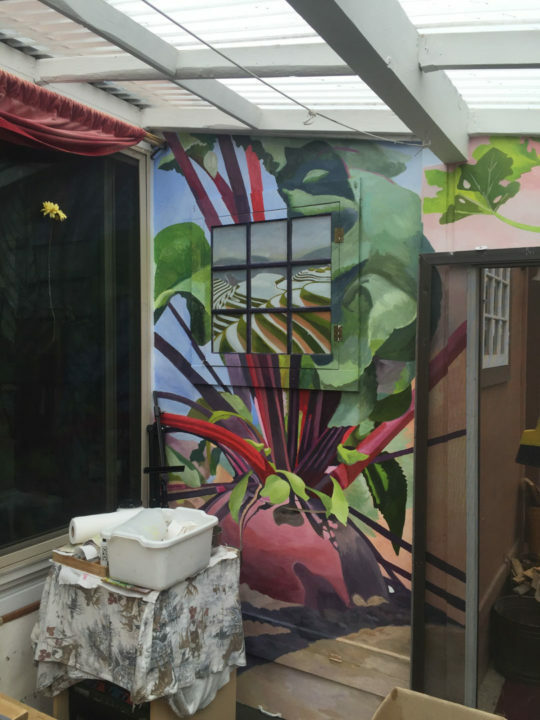 Starting on the east wall, I painted a giant beet, incorporating the window panes into the scene by emulating a view to a terraced landscape. 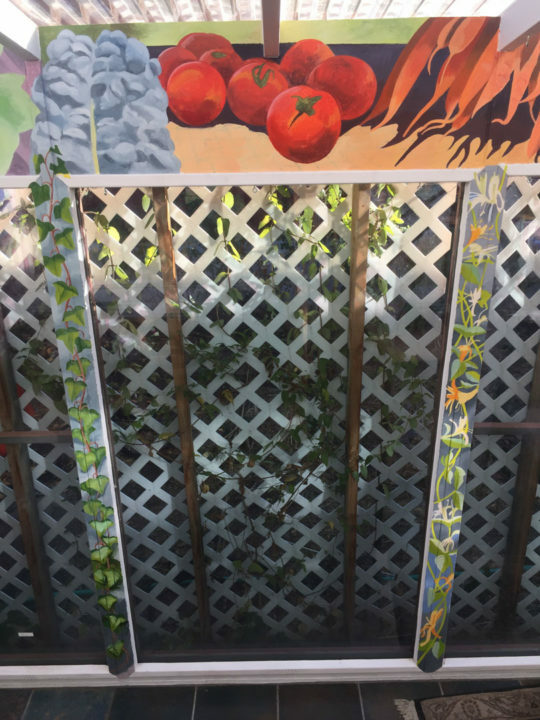 Squash, Cucumbers, Kale, Carrots, and Basil follow the corner to the narrow lintel, ending at the female meditator. 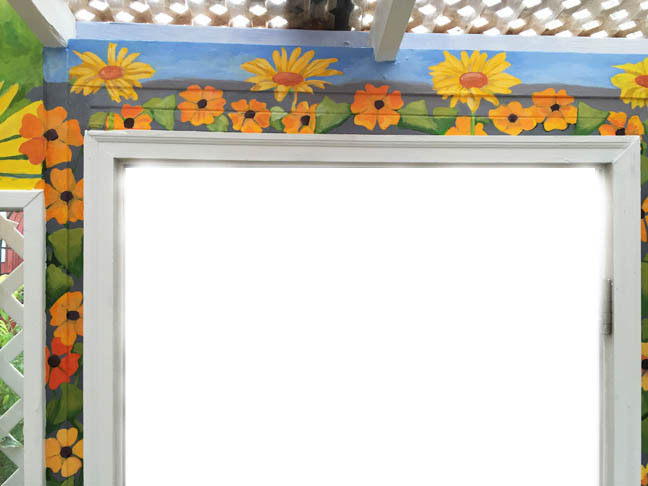 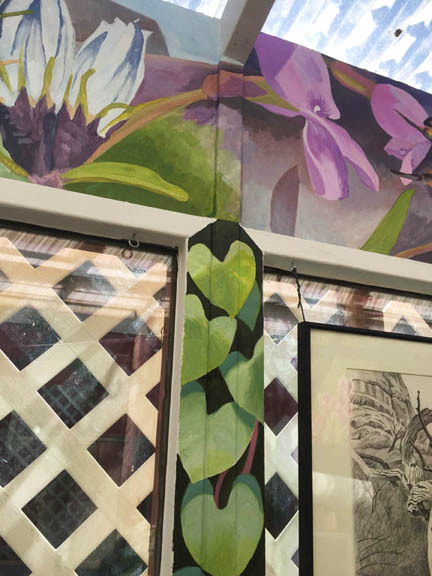 Additionally, I painted various vines and flowers, including Passion Flower, spiraling up the window supports, but didn’t finish those until the fall of 2016. 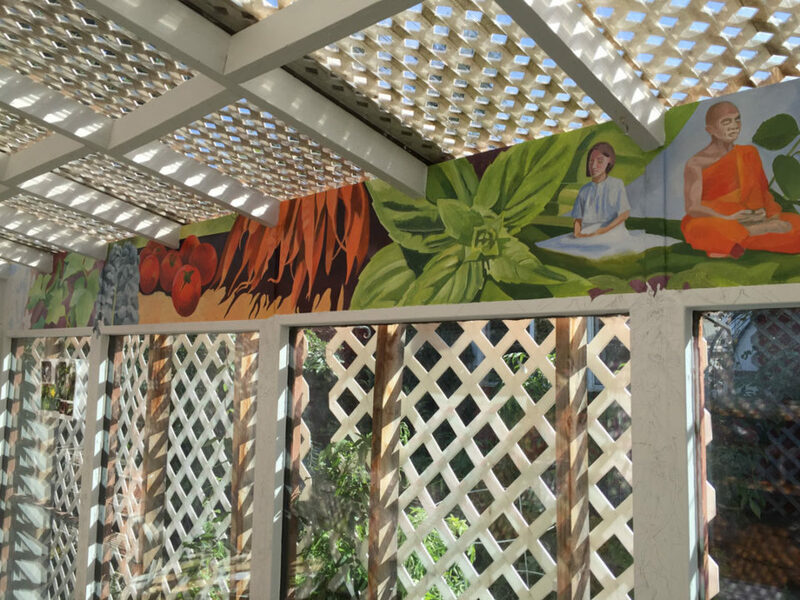 The couple meditating in the center of the mural was Gene’s idea and I think it works well, diminishing the sense of humanity’s dominance over the natural world, showing respect between the two species with the posture of meditation and stillness with the plants. 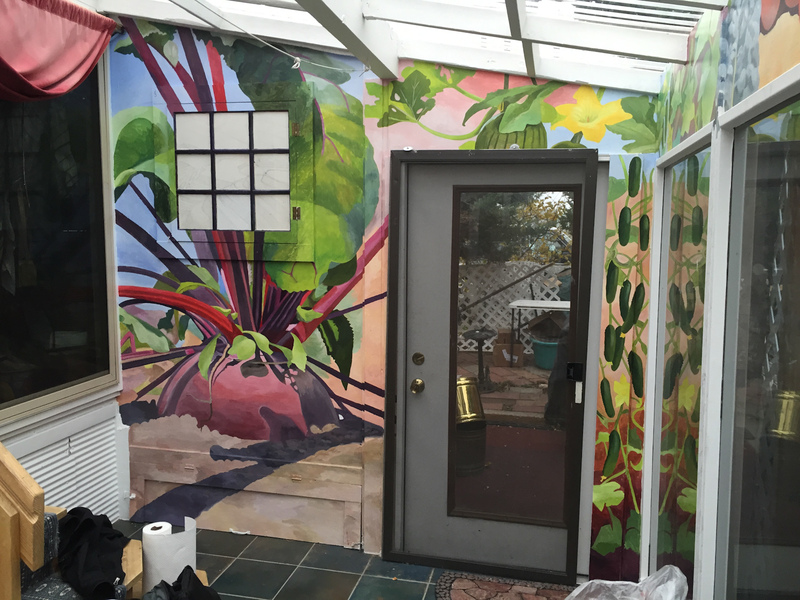 I had a lot of fun with this mural, and was fed creative and nutritious meals and drinks by Gene during the entire process, which took two years to finish. 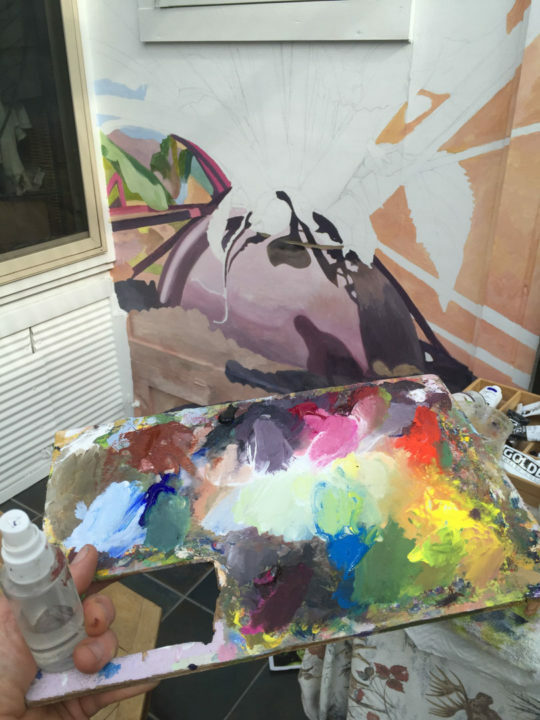 As well, this room twice became the ‘studio’ I displayed paintings and drawings in for Boulder’ Open Studio. 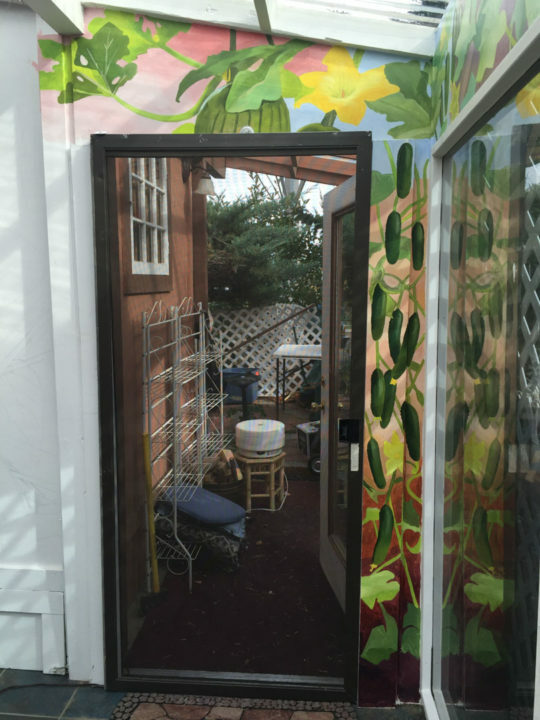 One final note: This mural in within walking distance of both the Unity Church Mural and Seemanta’s mural.